An eye-catching curve stitching design that creates a heart within a circle has been added here. The illustration shows the design stitched in confetti pink thread. The pattern size is 120 mm x 120 mm (4¾ x 4¾ inches). Please note that this is a challenging pattern designed for advanced stitchers. 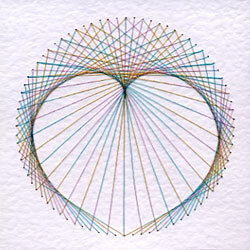 The design is a scaled down version of a mathematical pattern that I created for my String Art Fun website. If you are interested in creating pictures with nails and string you will find several free patterns to try at String Art Fun. This entry was posted in PinBroidery and tagged free pattern, PinBroidery on Friday 29 January 2010 by David Jefferson. Thank yo for your thoughts Cathy. I will be interested to hear how you get on with it, ease of use, etc. I forgot to say that one card was done with the varigated gold on the outside with bold metalic gold inside on a white card. I then backed it on a mirror gold and onto white. I should of took scans but I mailed them after swim class. third was done with metalic red for the circle and varigated red for the outside. This was done on white sparlkly cardstock. I put red mirrored under the card and mounted it on reg white. Thank you for your useful feedback Cathy. I am pleased that you are enjoying the design. I really love your new heart stitching patterns. I made one in red and one in gold for a ruby and a golden wedding anniversary. I found the top layer challenging on the first one but it had got easier on the second. I did find it better to mark the numbers on the reverse of the pricked card to make sure I was going in the right holes. Yes please, I’d love to see some more. I may seem very very slow but im not good with numbers so I dont quite get layer 2. Can someone help me with the pattern. Unfortunately we can not offer help for this very challenging pattern. Please try some of our easier patterns before you attempt this one.